The centerpiece of the PR105 Kitchen Ensemble is the double-bowl, stainless steel sink which is designed for under-the-counter installation. The larger bowl features a smooth D-shape with an offset drain; while the smaller bowl is an inch shallower with a center drain. Constructed of premium 304-grade steel, this sink is available in either 18 or 16-gauge. 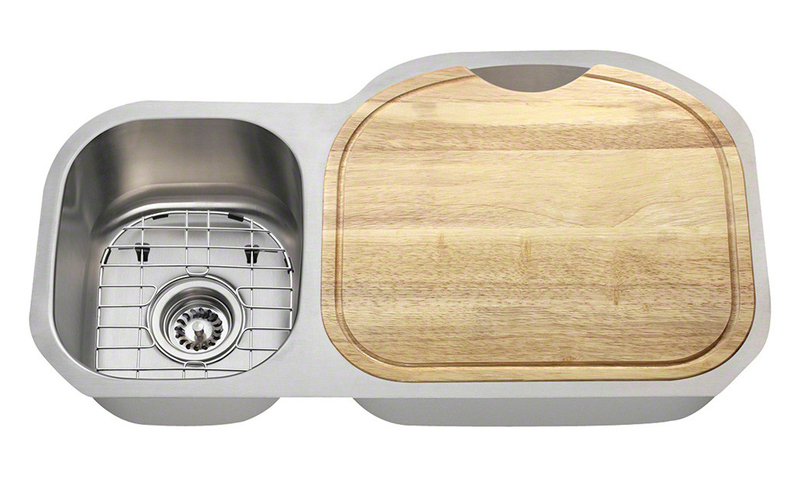 The ensemble includes two durable strainers, custom-fitted stainless steel grids, and a beautiful wood cutting board which perfectly fits over the larger basin. Insulation prevents condensation and dampening pads reduce noise, while the attractive brushed-satin finish hides minor scratches. Polaris Sinks limited lifetime warranty is included. See the PL105 Kitchen Ensemble for reversed bowls.